It doesn’t matter what the Universe throws at us, I know at least one of our spawnlings loves me–the one who made me Lava Candy!! Today’s tasty experiment is brought to you by Nefarious, our budding chemist/astrophysicist/mechanic. 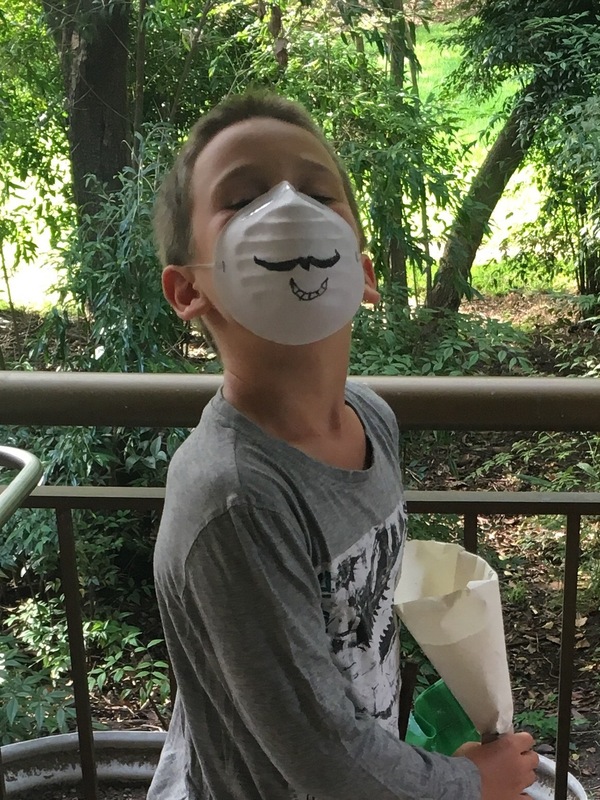 He wanted a Chemistry kit for his birthday. When the spawnlings’ godfather turned up, Nefarious was absolutely thrilled to have a real life chemist in the Lair and asked to bring out the kit. EG Tenacious willingly agreed; which is yet another reason why he (and his amazing partner EG Sinful) are the perfect guardians for our spawnlings, if something were to befall us. ** Adult assistance is required. Ingredients will get very hot and potentially burn exposed skin. Not nice. Continue to heat (there will be heavy bubbling of the mixture) and stir for 7 mins. DO NOT OVERHEAT. The syrup should be pale golden brown. Remove saucepan from the heat and immediately add the baking soda. Stir quickly but gently, making sure all the baking soda is completely mixed in. Pour onto a prepared paper lined dish/tray. Allow to cool for at least an hour. IT WILL REMAIN VERY HOT FOR QUITE AWHILE. DO NOT BE TEMPTED TO TASTE UNTIL COMPLETELY COOL. Break into pieces and enjoy and then coat in milk chocolate. Either dip in chocolate or pour melted chocolate over broken pieces. The ‘Lava Candy’ is a bit like Violet Crumble. Aussie minions will know what I mean. Trust me – it’s good. The science in all of this is in the reaction between the ingredients, particularly the addition of baking soda. It provides an excellent preliminary example of quick reactions between various chemicals. It also provides EG Mum with her own supply of chocolate-coated Lava Candy. So I see this as a win-win all around. It seems ‘world creating’ has become a thing in the EG Lair. 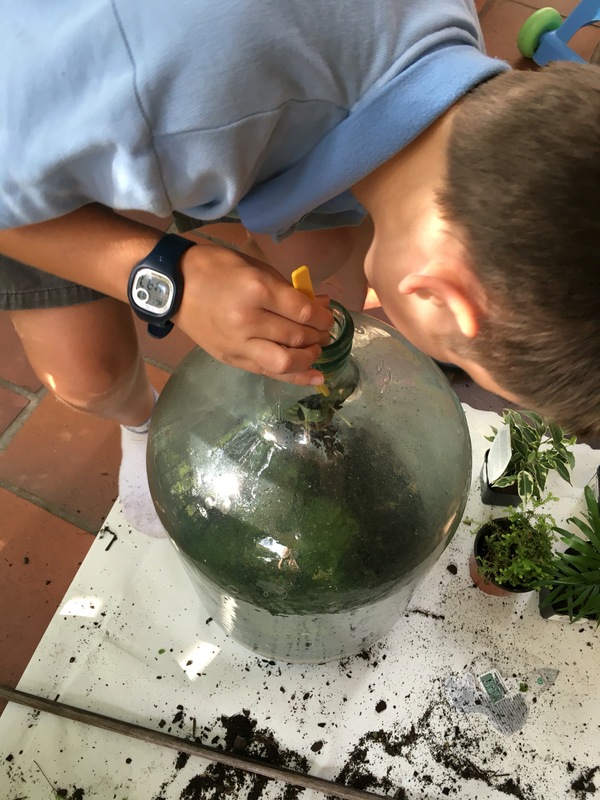 It all started with Sinister building his own terrarium for a school project last term (which he scored 93%… Such a good little evil genius…) – 3 months later and it is still going strong, without any further interaction. Not bad for a 9yo. 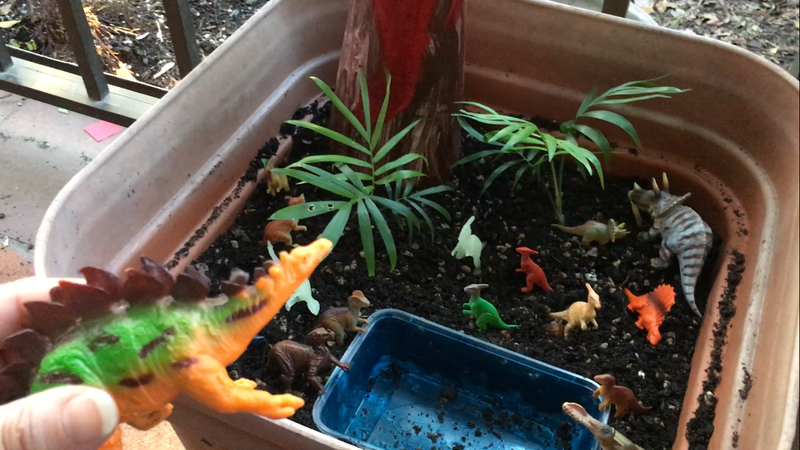 And thus the Dinosaur Project began. 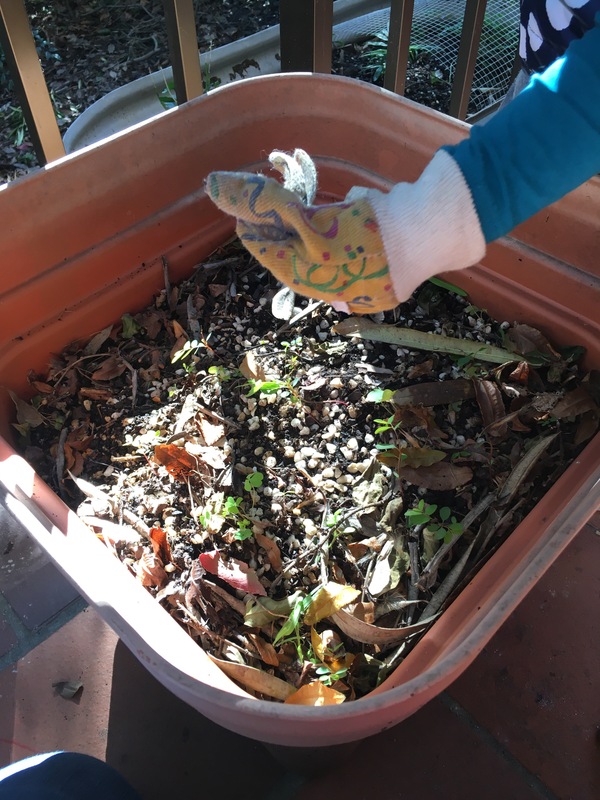 Fill the pot with the soil – ours was already full, but did require some weeding. 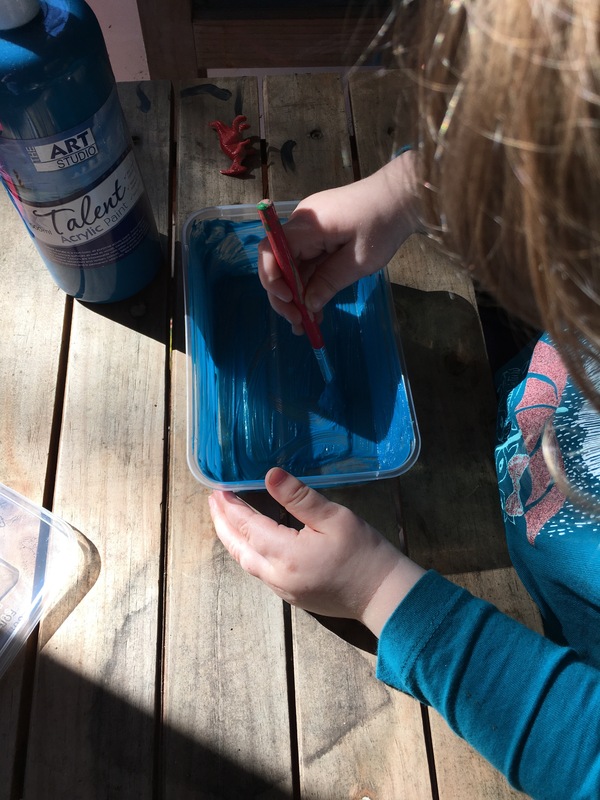 Paint the inside of your plastic container blue – you don’t have to but it did add to the aesthetics. Snap the top off the styrofoam cone. Don’t be too worried about neatness; you want it to be a little rough. You’re painting the sides brown, and the top red – Look! It’s a volcano! While you wait for the paint to dry, kick in to the gardening with your plants. Now you can add your volcano and your primordial swamp. I think we can do more with the swamp/lake but we can do that another day. In the meantime… RAWR!!! Zaltu is loving this little play area. She is really into the role-playing side, but I also noticed how quickly she picked up the carnivore / herbivore discussion we had earlier. 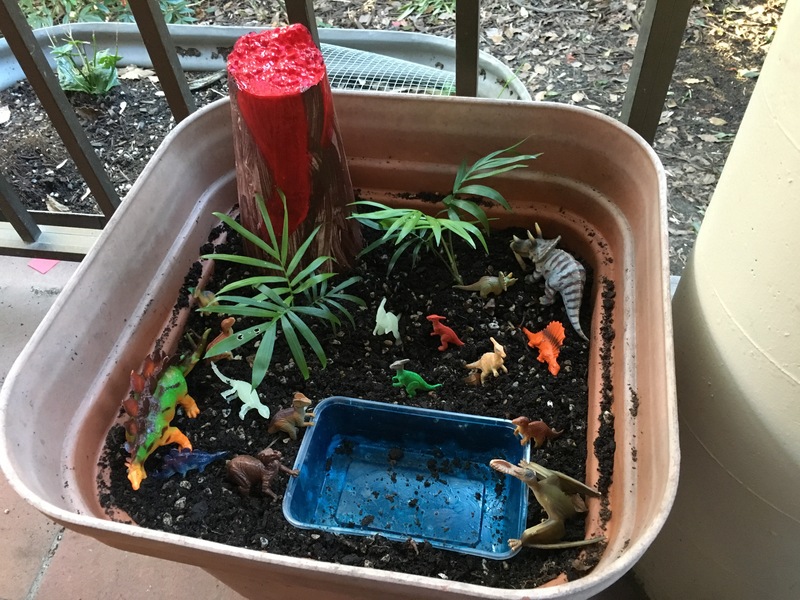 I would consider the Dinosaur Project a success. Now we are thinking of other ‘world creating’ play areas we can make!! EG Inc took a slightly different approach for our Forensic Friday today. I recently learned today, 15 April, is Leonardo da Vinci’s birthday. Senor da Vinci was a true Evil Genius. I really wanted to celebrate this day but I was stuck on ideas. 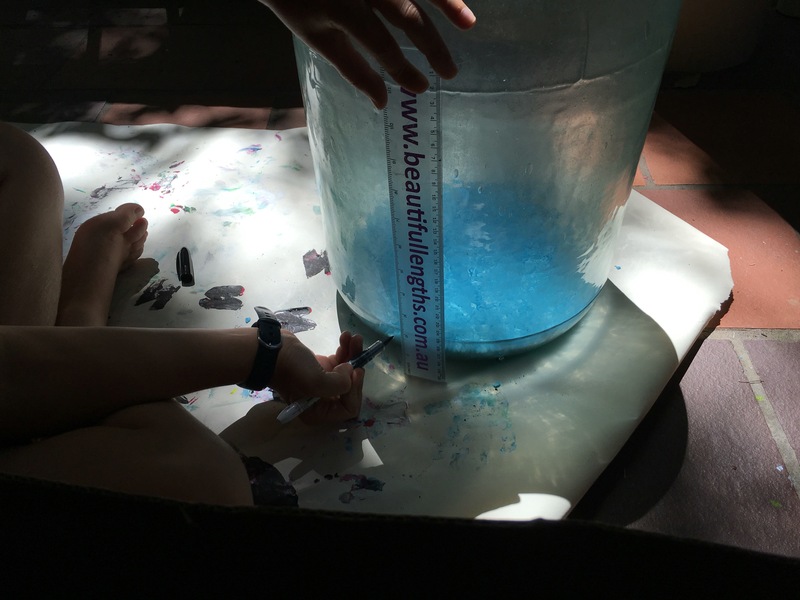 After reading a GeekMom article by My Little Poppies, I was so inspired by the idea of celebrating DEAR this week, I thought: why not celebrate DEAD – Drop Everything And Draw? And what better way to celebrate DEAD than with a DEAD artist… like Leonardo da Vinci. For those not familiar with DEAR, it means Drop Everything And Read. Author Beverley Cleary wrote about DEAR in her book Ramona Quimby, Age 8. It was such a hit, the USA hold national DEAR programs on April 12th, Beverly Cleary’s birthday. She is still alive too – celebrated the big 1-0-0 this week. At our local school (not US), the spawnlings practice both DEAR and DEAD in the classroom. I thought the timing was perfect for our Forensic Friday. The thing about da Vinci is that he wasn’t just an artist. He was a polymath; an individual that was brilliant at everything (particularly during or influenced by the Renaissance). We’re talking painter, sculptor, engineer, astronomer, anatomist, biologist, chemist, geologist, physicist, architect, musician, philosopher, and humanist. But I like a challenge. Today was in celebration of Leonardo da Vinci. Now remember we ARE on school holidays at the moment, and the two older spawnlings have definitely earned a rest. So I opted for just one of his many interesting inventions, The Flying Machine. I took most of my cues from a book I picked up a year or so ago: Inventions – Leonardo da Vinci, published in 2014 by Lake Press Pty Ltd. The Flying Machine was completely inspired by da Vinci’s jealous admiration for birds; particularly their ability “escape the Earthly bonds”. Namely, gravity. This was a great opportunity to kick the spawnlings outside – let’s find some birds or wildlife and draw it! We live next to a park with PLENTY of birds that wake Zaltu up every damn morning. Do you think we could find a bird today? All we could find was this bug. I don’t even know WTH it is. After our great exploration, we returned inside to observe and draw our wildlife. She chose to paint the participants in the adventure. Namely, herself. Literally. As you can see, she was mighty impressed with me calling an end to the artistic display. Zaltu calls this piece “Rainbow Zaltu”. You can have it as a complete work of art for a mere block of chocolate… but don’t call me when the artwork wakes you at 3am asking why the possums are allowed to play outside her window and she is not. Seriously though, Zaltu painted a beautiful wrapping paper design for da Vinci’s birthday presents. And was then upset when I had to explain there were no presents to wrap. At which point, Sinister realised da Vinci gained his deep understanding of bird muscles from observing them inside and out (read: dissecting them) and was a little … concerned. During which time Nefarious read ahead in the book and learnt about the blowy-uppy weapons da Vinci designed and wondered why we weren’t building our own canons instead. Broken wrist remember? We then had pizza for dinner and I sent them to bed – at 5.30pm. Because they tired me out. For a bunch of activities to do for a day, it was actually kind of fun. The spawnlings were truly amazed by the concept of a polymath. The sheer amount of study da Vinci undertook to confidently do the work he did. Not so much Zaltu (she is only 2) but definitely the older two. It was great watching them both realise you did NOT have to limit yourself to one speciality. You CAN be a marine biologist who incorporates art and software development in their work. You CAN be an astrophysicist who includes chemistry and electrical engineering in their project designs. DEAD was just something to start the discussion. The best ‘birthday present’ today was listening to all three talk about what they wanted to create tomorrow. I’ll let you know how Zaltu’s Batcave turns out. Last week, Sinister did all the prep work for his terrarium: Cleaning; and Foundation Layers. Now it is time to bring life to his project! 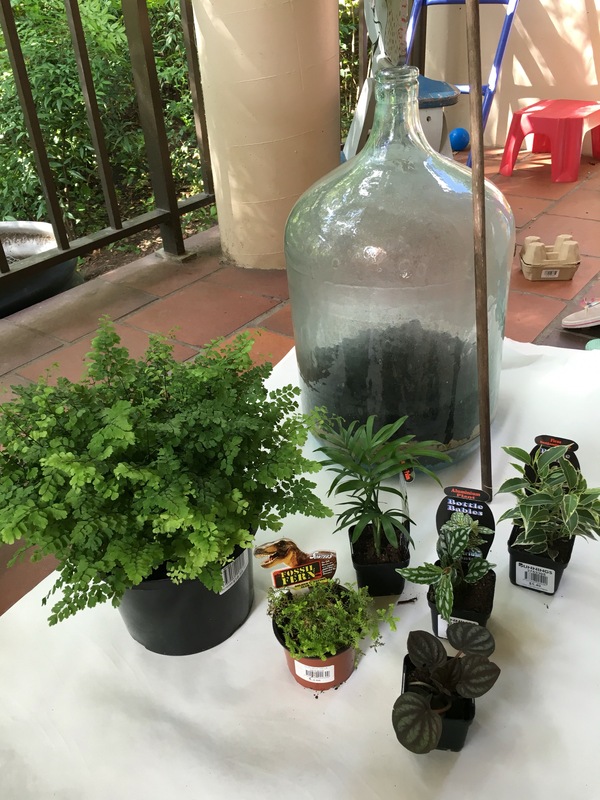 Not all of these plants are going in – and especially not all of the Maidenhair Fern! Sinister is also doing a smaller ‘back-up terrarium’ in a 3L OJ bottle with one or two of these plants. The Parlour Palm almost made it but he was concerned about space. This is important – you do not want to crowd your terrarium. You need to create a balance of life-cycle with moisture, light, and air-flow. Too many plants and you start to lose light and moisture while creating the wrong balance in air-flow. If you’re observant (and all aspiring Evil Genius should be), you have noticed the Maidenhair Fern … And how big it is. Good news is: ferns are fairly easy to break up. Sinister found a “how-to” video on Martha Stewart’s website. Seriously. Despite her jail time, she is pretty close to EG-material. Any plant you put in has to fit through the opening. 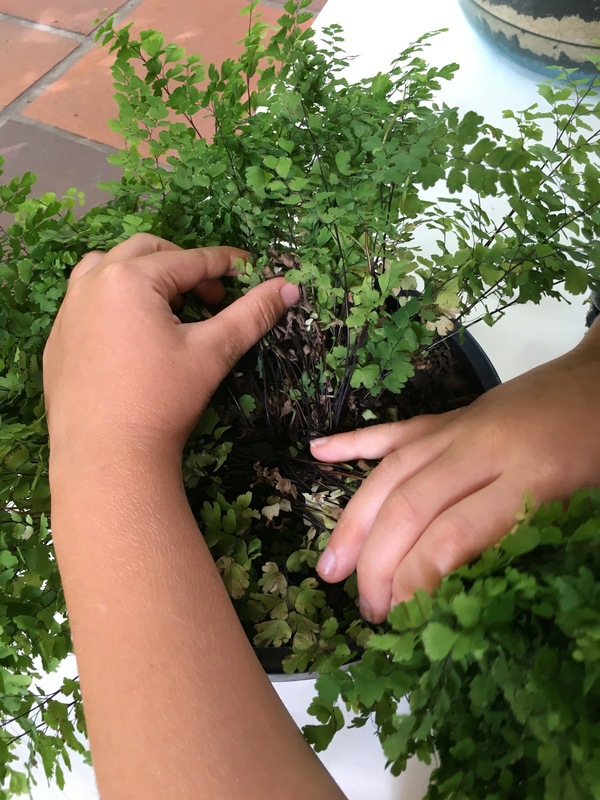 Maidenhair Fern can be divided fairly easily with a knife. Find the nodes on the plant (cluster points for the roots) and cut around them. Once you have loosened up the roots drop it in to the terrarium on the end of a stick, if you can balance it. 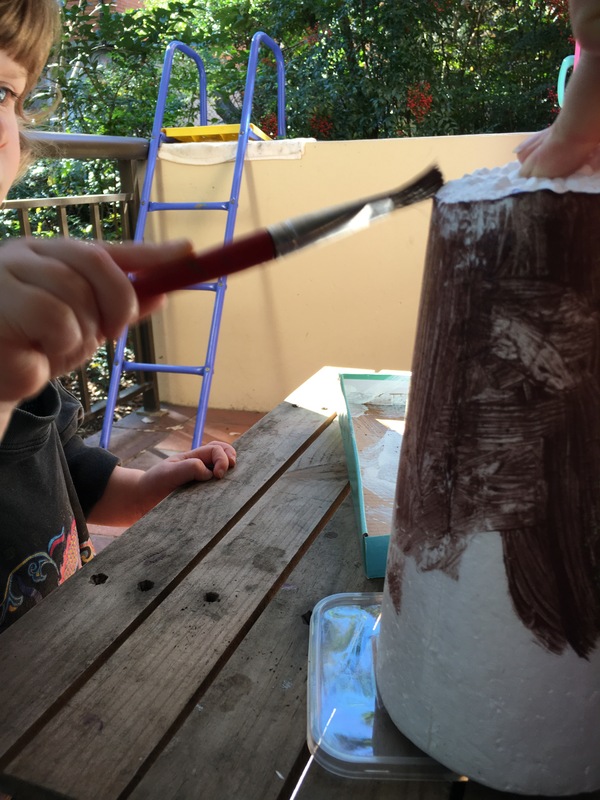 When putting the foundation layers in, Sinister used a tube to direct the flow. That probably would have worked here too. Once in the vessel, move the plant gently with a long stick. 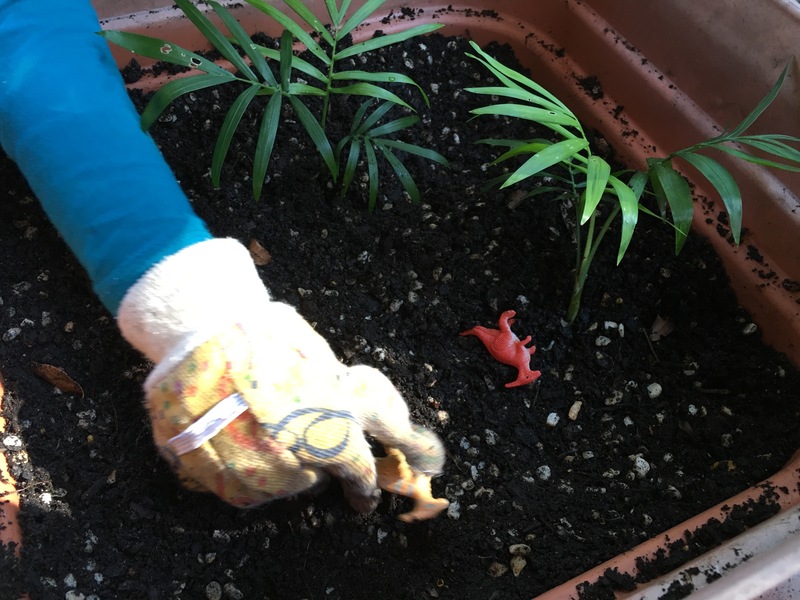 When you have it in place, gently push the plant into the soil with the stick. Each plant needs to have space away from the others (just like any sibling relationship). Sinister used some long-ish tweezers to “direct” his drop. His aim was pretty good. The last step was to add a little top up soil for the plants, and a few table-spoons of water. Enough to moisten the soil but don’t saturate it. The condensation cycle should start within a day or two, and that should start producing enough moisture for your plants. And that, my dear minions, is Sinister’s Self-Sustained Terrarium. He is now in ‘Observation/Maintenance Mode’; Checking it every day and noting down any changes or maintenance required. This project is due for submission at the end of March so we’ll keep you updated then. UPDATE: Sinister received 94% for the entire project, with special mention and a Merit Award for his terrarium. The teacher was most impressed with his detailed report on all of the steps preparing and building the mini-ecosystem. There’s the secret, minions: write EVERYTHING down. 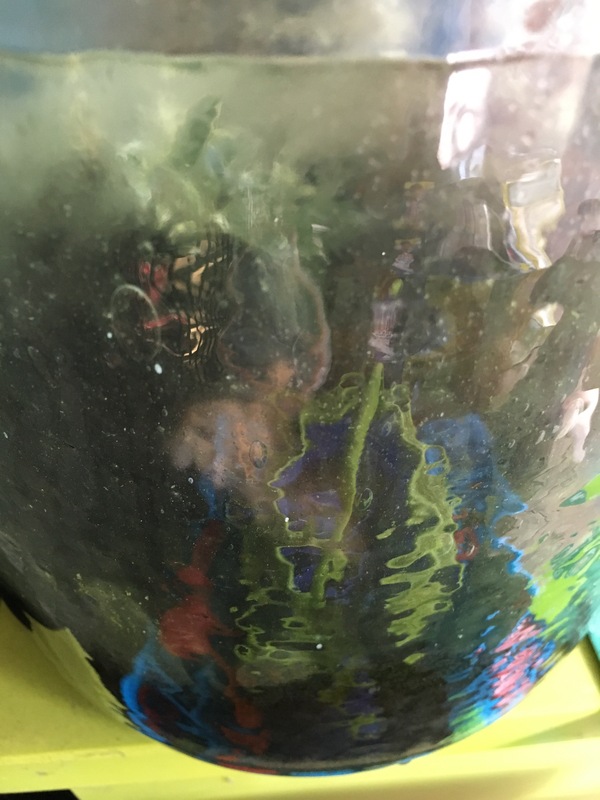 UPDATE: 12 months later – and the terrarium is still going strong. One of the plants has brown leaves but is not dead. 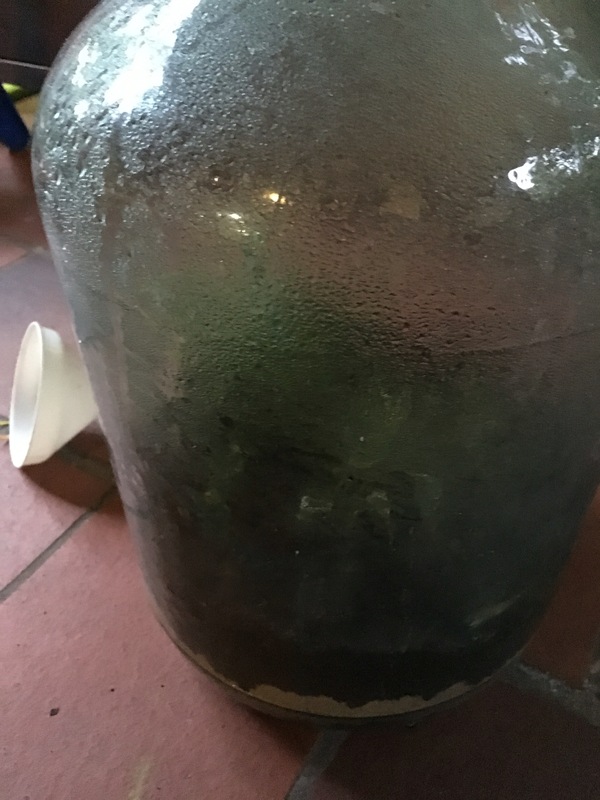 Condensation is still cycling inside and it looks strong and healthy. Man, he really knows how to do a science project! If you really want to create your own world to conquer and command, you need to do some prep work. For those tuning in for the first time (slackers): Sinister has chosen to build his own self-sustaining terrarium for a science project. 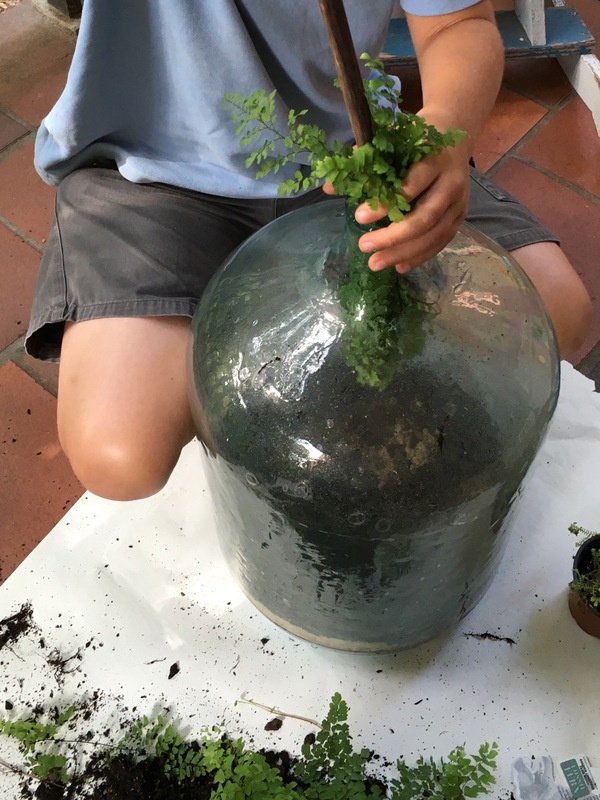 He has already researched what he needs and the environment he needs to create; we bought a demijohn (glass jar) and he has cleaned it up. Today, he is preparing the foundation for the plants. The first thing he realised was how narrow the opening was. No matter what he puts in there, he needs to be careful putting it in. Sinister came up with the idea of a funnel and a conical style tube – like a long straw. 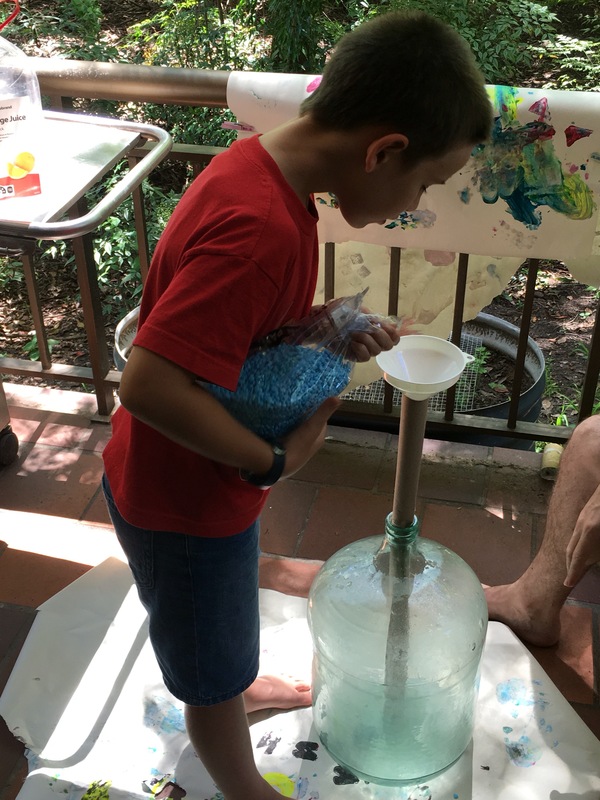 By using the long tube, he could control how much of each substance would disperse at the bottom, limiting the mess at the bottom. Gravel allows drainage, preventing water from pooling in your soil and rotting the roots. Charcoal is great for cleaning out toxins, in the soil and the air. This helps prevent too many micro-organisms in your set-up. Sand is, again, about drainage but it also gives some stability to the plants’ roots. The final and crucial layer, but don’t lay it on too thick. Keep it a little moist but not heavy in the plants. There is a magical ratio for the layers, providing a good foundation while allowing plenty of air-flow with the condensation cycle. One third of your terrarium should be made of materials which are not air. Sinister explained the importance of ‘air-space’: the air-flow ensures the plants have fresh nutrients both above and below the surface. It allows sunlight to come through, which is a nutrient, and encourages the condensation cycle to distribute evenly through the terrarium. Stagnant air chokes the plants and that is bad for everything. Ignore the ruler propaganda – it was the closest ruler he could find. The point here is to measure your environment and plan your layers accordingly. So now the foundation is in, Sinister just needs to figure out how to put the plants in. I reckon he is up for the challenge. Sinister is starting off his school year by creating his own world to command and conquer. I like this teacher already. Sinister is in Year 5 OC (Opportunity Class – like a Gifted program in the public school system). In Science they are studying Space – Significant astronomers; Creation of the Golden Record; How to Survive in Alien Environments (biospheres). As part of his assignment, Sinister has chosen to develop his own terrarium, focussing on the creation of a self-sustaining environment. It’s a huge project but he is already noticing how to break it up into smaller scientific components. For example: we bought a demijohn glass jar on eBay for $20 to house his terrarium (with cork plug). However, it needed a clean. 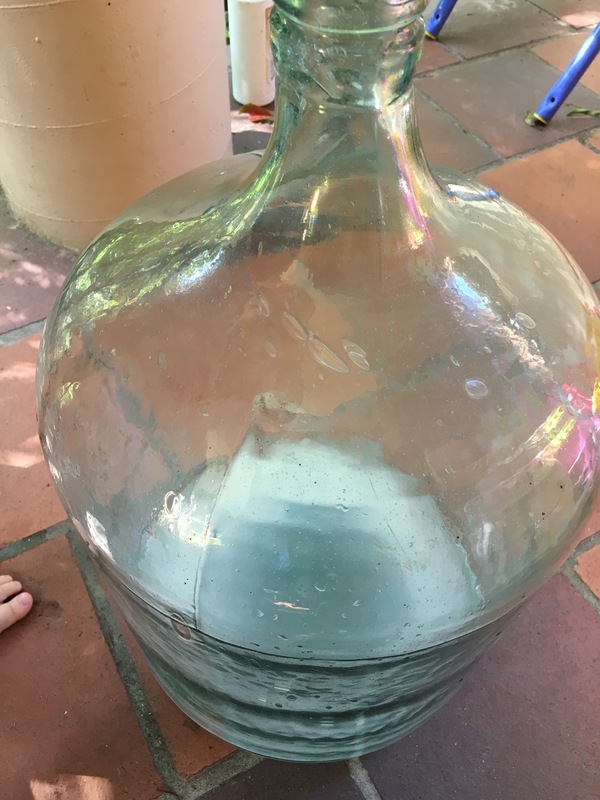 Hypothesis: That we can clean the demijohn with vinegar and uncooked rice; that the vinegar would wash and disinfect the jar without leaving a heavy chemical residue; that the rice would lightly scrub the jar without scratching. 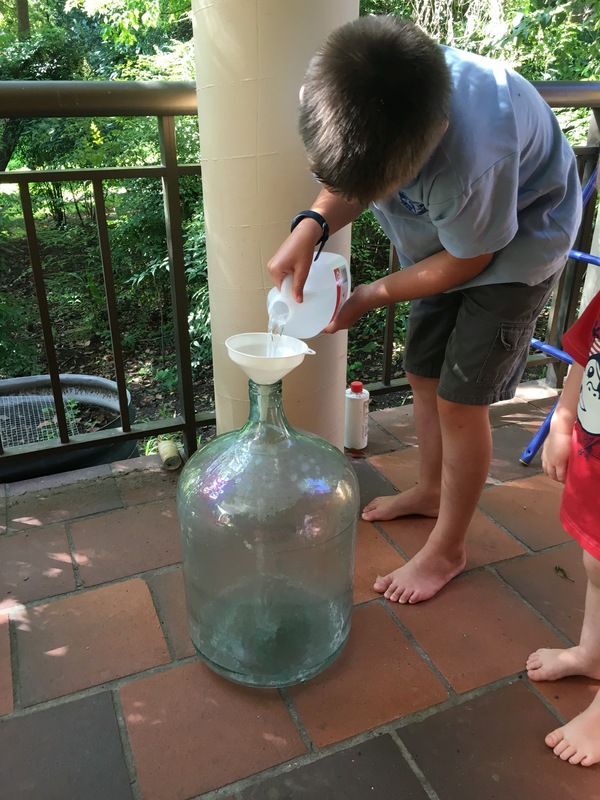 Pour about a litre of plain white vinegar into the large demijohn. Put in the cork and shake it like a Polaroid picture… Well, make sure you use two hands; it’s heavy!! Rinse out with copious amounts of water. Damn thing pretty much glistens. 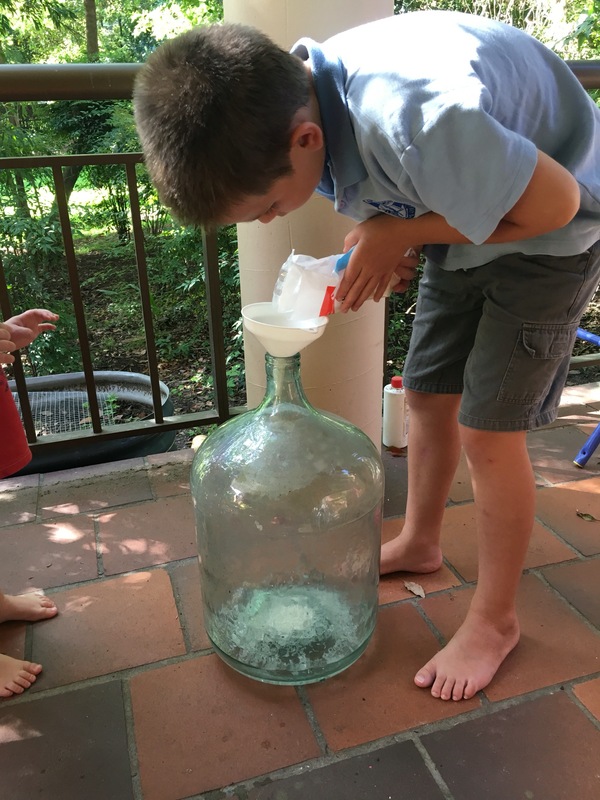 This mini-experiment produced the exact results he was looking for. Next week: Sinister figures out how to fill and build the soil layers for his terrarium. 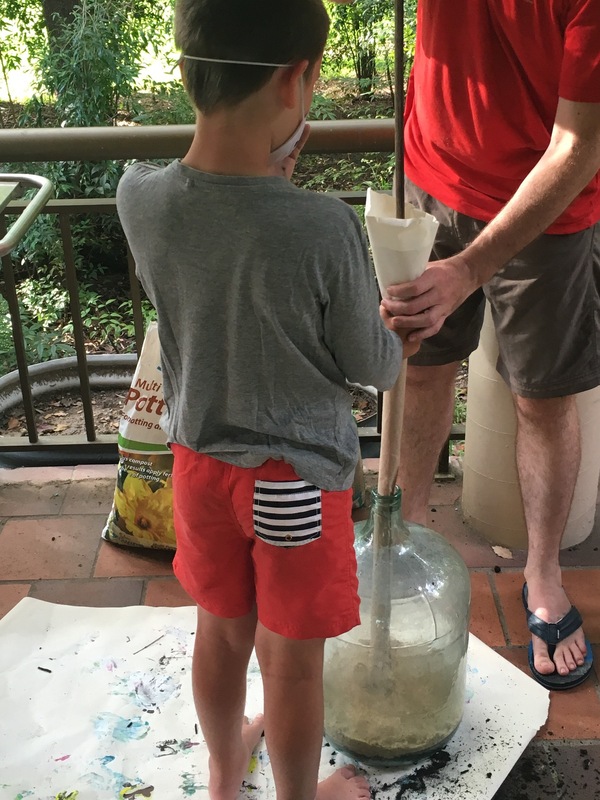 That’s a tight neck there on the demijohn … But he has a plan!